Nutanix Just release AOS 5.6 along with Prism Central 5.6, AFS 3 and AHV-(20170830.115). Nutanix AOS 5.6 brings forth Virtual Infrastructure Management capabilities via the RESTful V3 APIs. These APIs are built on an Intentful model and are limited to Prism Central. They will allow customers to deliver a self-service portal functionality to their IT organizations along with many other features such as microsegmentation. Previously, a Prism Central instance was limited to a single VM. You can now expand (scale out) a Prism Central instance to three VMs (also known as nodes), to increase the capacity and resiliency of Prism Central. Scale out Prism Central is supported on AHV or ESXi clusters only. It is not supported on Hyper-V.
A part of the Nutanix Flow offering, is now generally available in AOS 5.6. Prism Central enables you to create security policies that protect all traffic to and from a VM through a stateful firewall running inside each AHV host. A security policy definition includes the category of VMs that you want to protect, a whitelist for inbound traffic, a whitelist for outbound traffic, and the protocol and ports that can be used in the inbound and outbound directions. You can also block communication between two categories of VMs by configuring an isolation environment policy, and you can quarantine a VM, optionally subject it to forensic examination, and then release it from the quarantine when it is safe to do so. Prism Central now supports the creation and assignment of categories. A category is a grouping of entities into a key value pair. Typically, new entities are assigned to a category based on some criteria. Policies can then be tied to those entities that are assigned (grouped by) a specific category value. A traditional Nutanix cluster requires a minimum of three nodes, but Nutanix now offers the option of a two-node cluster for ROBO implementations and other situations that require a lower cost yet high resiliency option. A two-node cluster can still provide many of the resiliency features of a three-node cluster by adding an external Witness VM in a separate failure domain to the configuration. Starting with release 5.6, the Witness VM image is built independently from AOS. This new Witness VM can support both Metro Availability and two-node clusters. AOS and AHV now support up to 80 TB of storage per node. Use cases for this storage capacity include Acropolis File Services, back up, and cluster capacity expansion. This feature is available on NX-6155-G5 platforms. AHV hosts now support the load balancing of vDisks in a volume group for user VMs. Load balancing of vDisks in a volume group enables IO-intensive VMs to utilize resources such as the CPU and memory of multiple Controller VMs (CVMs). vDisks belonging to a volume group are distributed across the CVMs in a cluster, helping to improve performance and prevent bottlenecks. However, each vDisk still utilizes the resources of a single CVM. You can initiate safe and graceful power operations such as soft shutdown and restart of the VMs running on AHV hosts by using the aCLI. 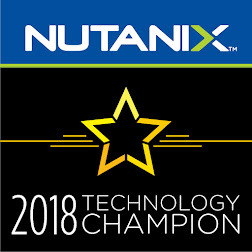 The soft shutdown and restart operations are initiated and performed by Nutanix Guest Tools (NGT) within the VM, helping to ensure a safe and graceful VM shutdown or restart. You can create a pre-shutdown script that you can choose to run before a shutdown or restart of the VM. In the pre-shutdown script, include any tasks or checks that you want to run before a VM is shut down or restarted. Nutanix has implemented security rules checks in the Controller VM to support compliance with the Redhat Enterprise Linux 7 (RHEL 7) STIG, as published by the Defense Information Systems Agency (DISA). Nutanix has deprecated the inclusion of TLS 1.1, TLS 1.0, SSLv3 and any non-ephemeral ciphers in the entire Nutanix line of products. Today, all Nutanix products (for example: AOS, Prism Central, AHV) communicate over TLS 1.2, GCM preferred ciphers, by default. Nutanix clusters now generate an SNMP trap named ntxTrapResolved when an alert is resolved either manually or automatically. The resolved trap contains existing and new MIB objects, including an alert UUID object that enables you to determine which alert condition was resolved. NOTICE: 5.6 is a new AOS Feature Release, which is not Long Term Supported (LTS). If you upgrade to this version, the support will only be for 6 months after the Release Date, within which period you will have to upgrade to the next feature release. If you are interested only in bug fixes and not new features, please do not upgrade to this release. The next LTS Maintenance Release, 5.5.2 is expected to be released in April 2018.